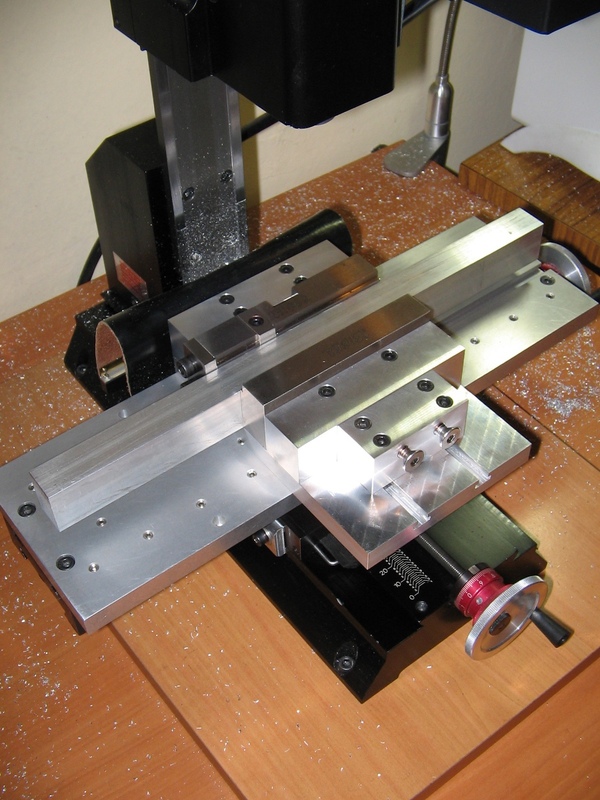 A tipical problem: I need to mill a slightly long part, let’s say, a 10x10x130mm bar. Sure, you can use the good Sherline vise and clamp the part by the middle, but vibration at the ends of the part is a problem. So after getting inspired by this and this , I decided to build my own wide low profile vise. First, I bought a pair of used step jaws. They are really high precision, and include two stop options. As I understand this jaw types are for Kurt type vises, the big brand in professional vises (of course my vise will be a joke compared to one of this vises, but that’s not the point). 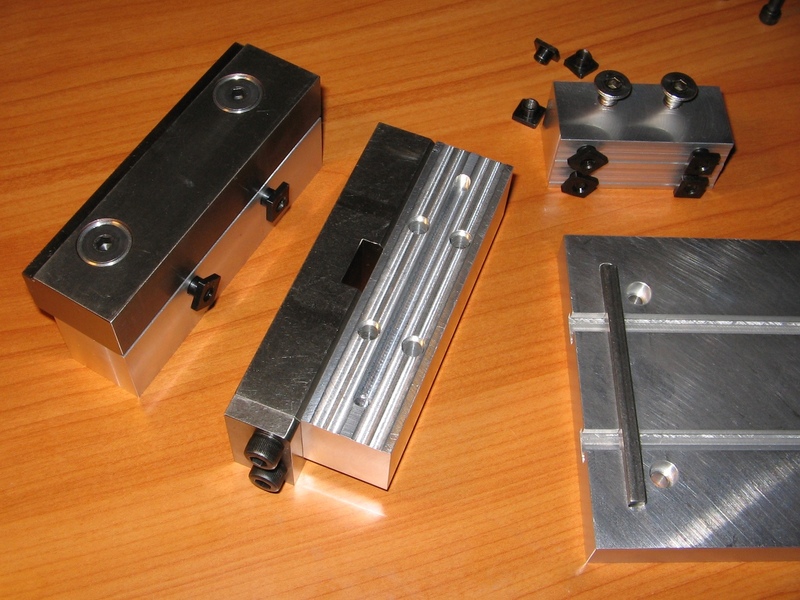 Interchangeable jaws (must fit my Kurt 4″ jaws of course). Should be able to be used in the X or Y axis. Should not require clamps for installing. For light duty work (well, this cover Sherline use). And, of course, a simple design. 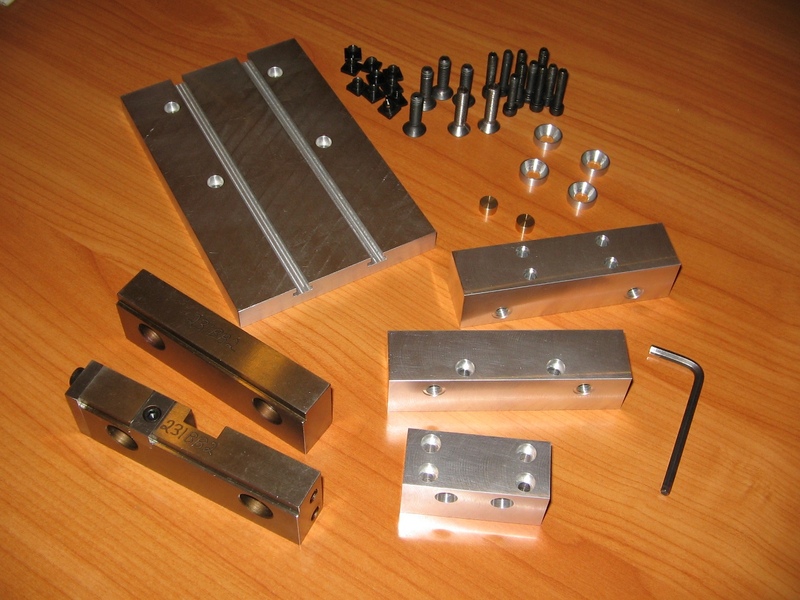 I choose 1/2″ tooling plate for the base and 1″ square bar stock for jaw supports. As always, after some draft drawings I began the building process. Milling T slots (easier than what I expected). Cutting and squaring jaw supports. Drilling a lot of holes (harder than what I expected). Some parts appears in previous posts. Here are some pics. And here’s the assembled and installed vise. After clamping an aluminum bar I found a problem: front and back supports lift about 0.5mm after tightening; it seems aluminum over aluminum lifts, but t-nuts remains fixed. So after that I add a key to the fixed jaw support (previous pics show that); at least this will allow to keep alignment. Installing it’s a bit tricky, as two of the clamping screws go below the back jaw support. How much clamping force? I don’t know, but at least I was able to raise the whole mill holding the clamped bar with both hands (I was not able to take a picture of this). That’s enought to me. Here are my vise and the Sherline one. Tightening looks, at first, a bit troublesome, as this requires to tighten 8 screws, but anyway it’s a less than a minute process, so I can live with that. Sure, this is a light duty vise, but I love the step jaws, the stops and the fact it’s low profile. I must admit I would have like a larger back for the movable jaw support, but space limitations led me to the actual design. 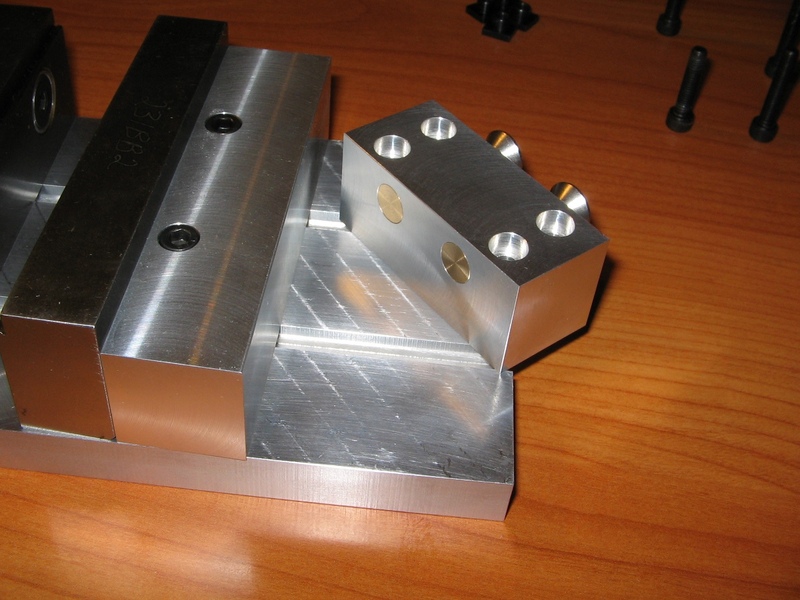 This vise can be used to clamp small flat plates, but a simpler solution for this are Dave Hylands Fly Cutting Clamps. They are the best practical design I’ve seen fot this type of clamps, so for sure I will anotate this in my long list of some-day-I-will-do projects. Another of my want-to-do project. I must try to stop reading your posts; project lists getting too long but time too little. Think I need to seek help on this. 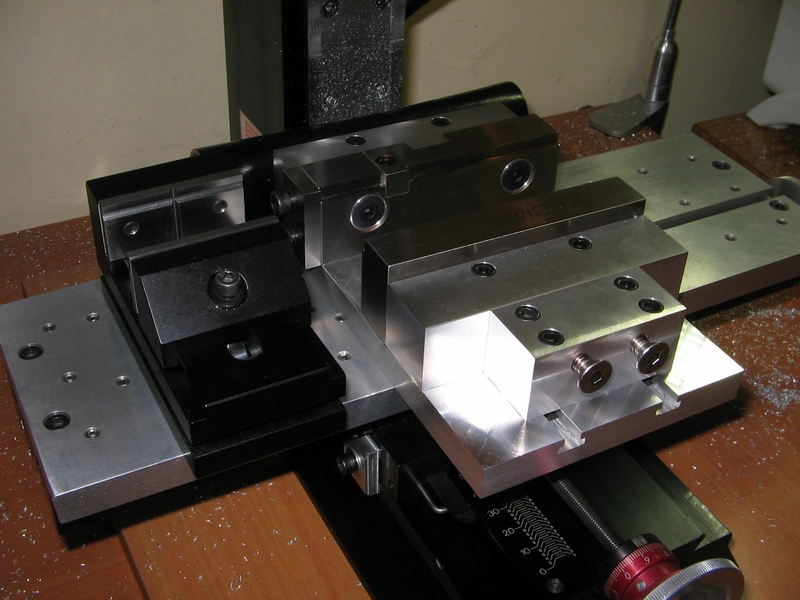 This low profile vise looks easier for me to implement than the others. I’ll give it a shot. First off, to buy the T-slot cutter after lunch. Hi, I’m Italian and I congratulate you for your site and your works!!! I ask your help: how did you created the T-slots? Let me explain: What drill did you use? 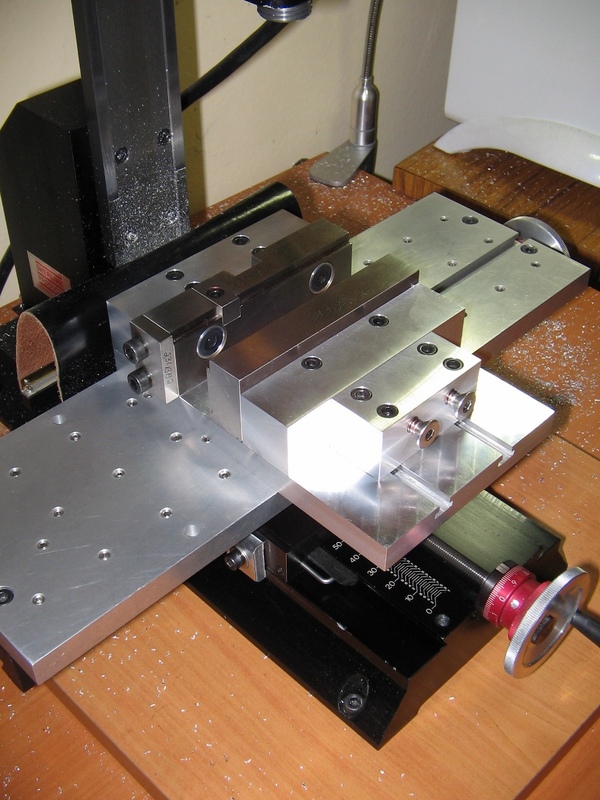 I can not find T-milling for my six millimeters spindle! Thanks. I was lucky as I found a 7.5x2mm woodruff cutter on a local flea market. These cutters are really hard to find. You cant try to make your own, as some guys do: http://homepage3.nifty.com/amigos/t_slot_cutter/t_slot_cutter-e.htm (very nice, a project itself, wish I try some day). Regarding the cutting process, of course you first cut the middle area with a standard end mill, and the cut the sides with the woodruff, using a small cutting depth and cleaning with a brush between passes (woodruff cutter can clog if you take too much material). As a final step I did use a small dovetail end mill to cut a small chamfer underneath the slot ways. T-nuts aren’t really “T”, they have a small radius near the threaded/flat-part join. Good luck!